Not often when you report an abandoned vehicle to the police, do you get to hear the end of the story. In this case, the white Ford van was stolen. It now sits parked outside Idyllwild Garage, waiting on the insurance company to make its report before returning it to its owners. However, in my attempt to be a good citizen, I may have implicated myself in the crime. You see, my fingerprints are all over the driver’s side handle. It all started a couple of weeks ago, when I noticed the white van parked in the pullout near Valle Vista. It’s a popular pullout because it’s close to the bridge and the creek, and oftentimes people go there in the summer to cool off. Days later, I was going down the hill again and noticed the same van parked there. This time, I was concerned. Mostly because it was after the weekend, and it hadn’t moved. Was the guy on an extended fishing trip, or did something happen to him? In my short stint as a newspaper reporter (Idyllwild crime was my beat), I learned to notice inconsistencies. I once called a sheriff’s deputy about an abandoned truck in Valle Vista. (My editor thought it may have been associated with illegal dumping at the time). As it turned out, the truck’s owner was an out-of-work musician who hung himself in a nearby tree. He had even left a note in the truck. The police blotter only mentioned the abandoned vehicle. So knowing that, I got the license plate number and the number of the nearby mile marker, and reported the abandoned van to the police. They took down my information, and said they’d send an officer out to investigate. I laughed with the dispatch operator about the driver being on a long fishing trip. I didn’t mention any hunches about dead bodies. Three days later, I passed the same van again, but this time it had graffiti tagged all over it. On one side, they used profanity. It was no longer a nuisance vehicle, but an eyesore. I called the police again. But this time, they directed me to Code Enforcement. I guess any abandoned vehicle that had been damaged, was now their problem. I gave the same story, and the officer said he’d open a file and get right on it. On May 21, I got tired of waiting on the police to tow the vehicle, and stopped to take pictures. It had “Infamous” written on the hood and rear. Thinking about the abandoned vehicle/suicide in Valle Vista, I tried the door handle. After all, there could be a dead body inside. Inside, the van smelled of cigarette smoke, and the ashtray was overflowing with butts. There were clothes all over the back from a laundry basket. The graffiti taggers must’ve rummaged through them looking for money or valuables. However, they overlooked a Gucci makeup bag. I was glad that there was no corpses, or anyone hurt inside. I tried to take a picture of the inside, for what reason I don’t know, but my flash didn’t go off. My camera said that I needed to replace the batteries. 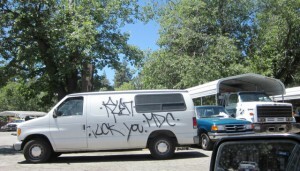 That was the end of the story, until today when I saw the van parked outside Idyllwild Garage. I spoke to one of the mechanics, telling my good citizen story. 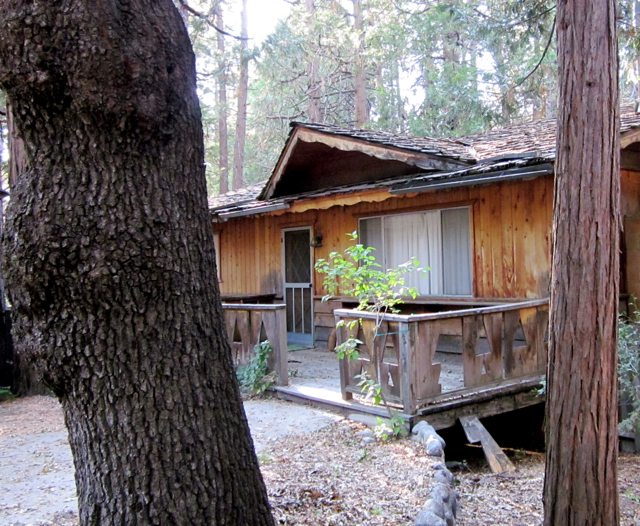 “Funny that it would end up here in Idyllwild,” I said. 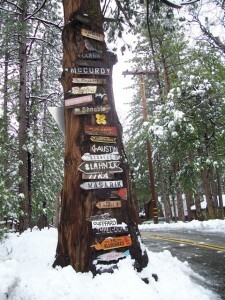 The owners were not from Idyllwild, he added. Then I started to sweat. My fingerprints were left on the door handle. Should I turn myself in, and confess nosiness? Are my fingerprints impeding the sheriff’s investigation? I decided to lay low and wait until the police come to me. Surely, they have records of me reporting the abandoned vehicle twice in one week. When you report anything to the police, you always have to give your name and phone number. But I’m worried that I’ll get busted for stealing the van. I’ve seen too many Film Noir movies to know that anyone’s luck can change on a dime. A good deed can land you in the clinker, and there’s nothing you can do about it. Due diligence is what will help Idyllwild in its latest crime spree. In a Town Hall meeting held at the Idyllwild School on Saturday, March 24, about 100 townspeople were there to express their fears and find some answers. Some of my neighbors were there. It’s not important that I didn’t go to the meeting. What is important is that I know my neighbors. 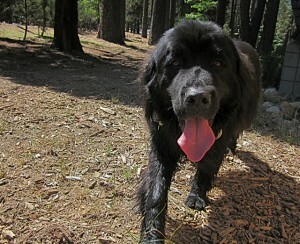 And that I talk to them about what’s going on in the neighborhood when they’re out walking their dogs. Or we’re helping each other shovel our driveways. That kind of neighborhood diligence will help combat crime. Two years ago, we all banded together to shut down a drug house at the end of our street. Some enterprising renter decided to open up a drug house and supply the neighborhood with pot and other drugs. New cars started lining the streets, but most would only stay for a few minutes. Odd people would walk by in the middle of the day, not waving or looking you in the eye. Then the drama started. Cuss words coming out of the mouths of grown women. And fights over money. The cops were there a lot, and finally they made her move out. Guess they got to the landlord (who was out of state). The last time I saw her, she was carrying a puppy in her hand along Hwy. 243, showing it to drivers trying to sell it. The moral of this story is not how to combat a drug house in your neighborhood, but how you and your neighbors can band together to stop crime. During that time, we would all talk to each other about what we saw, and heard. Some reported her to the police for disturbing the noise ordinance, while others called Code Enforcement for all of the junk in the yard. I should have been on high alert when I read in the Town Crier that my neighbor had reported break-ins in part-time homes around her. I’m only 10 houses away. “I don’t have anything to steal,” I’d laugh and say. Except I’d cry if anyone took my MacBook. Then my neighbor from Los Angeles told me that some thieves broke into a neighbor’s house while she was at home! The woman was disabled, so they just kept robbing her! That neighbor is a credible source, so I believe him. He’s in his 70s and worked in insurance investigations. The in-home invasion, he said, was near McMahon (where Marion View Drive turns into Double View). My guess is that the thugs are targeting homes close to the highway. Just one turn and they’d be on Hwy. 243 and out of town. My brother was a loss prevention officer for JC Penneys in Omaha. Too many times, he said, he would get pepper sprayed in the face by robbers. They would pack things into suitcases or bags and put them by the doors. Then they’d rush out to a waiting car and speed away. In pursuit, my brother would get sprayed–all for minimum wage. But that lesson taught me that robbers want a clean getaway. They want the fastest way out of town. So if you live along Hwy. 243 in Idyllwild, it’s time to be diligent. Lock your doors, and report strange activity to the police. Mountain Top Liquor was robbed at gunpoint a few weeks back. Richard, the clerk on duty at the time, said the guy knew what he was doing. Then the robber took off on foot behind the Fort, likely to a waiting car. Richard said the guy must’ve known someone locally because he knew where to park and get away quickly. I’ve been careless about locking my front and back doors at the same time. I also forget to lock my car, but secretly I hope that one would get stolen. However, I wasn’t expecting a knock in the night. It was around 10:30 p.m., and I figured my boyfriend forgot his key. The bedroom is upstairs, so it took me a few minutes to open the door. By then, no one was there, but a station wagon was parked just beyond the driveway. I could see its frame in the moonlight. I flicked the porch light and waved. But the car sped off. It wasn’t my boyfriend’s friends dropping him off. Was it someone just lost, looking for another house? Or were would-be thieves checking me out? I noticed that the window was open a crack (for fresh air), but it could’ve easily been pried open. My car, covered in snow, was parked across the street because I have a slanted driveway and its easier to get out in the snow. The porch lights were on, but maybe they were wondering if anyone was at home? Keep in mind when they knocked, no dog barked, because I don’t have one. But my boyfriend has a viscious cat that I wouldn’t think twice about letting out if anyone forces their way in. And they’re lucky I don’t have a gun. The home invaders are lucky that that invalid woman didn’t have a gun. Many people up here have guns, and I’m not just talking about Tracy Filippi, the bug guy. Women have guns in their homes and in their cars. I’ve talked to a lot of them at the American Legion. These women are senior citizens, but many of them have also served in the military and know how to use a gun. They wouldn’t think twice about shooting anyone who forces their way into their homes. My guess is the crime spree for homes and businesses along Hwy. 243 in Idyllwild will continue until someone gets shot. And then it won’t be like taking candy from a baby anymore. The pot dispensary in Valle Vista will be pressured to close. The “medical” marijuana dispensary operating across from the Shell Station in Hemet/Valle Vista is on Riverside County Supervisor Jeff Stone’s hit list. It’s one of 36 pot dispensaries illegally operating in unincorporated areas of Riverside County, which have been banned since 2006. According to the Dec. 14th issue of The Californian, this move from the County Supervisors comes one month after a state appellate court upheld the city of Riverside’s ban on medical marijuana dispensaries. According to Corinne Daly, one of Supervisor Stone’s legislative assistants, the property located at 44518 Florida Avenue in Hemet/Valle Vista, is on their current list of closures. “Our office is working closely with Code Enforcement and our legal and law enforcement team in having those activities come to a halt,” Corinne wrote to us in a recent email. The exterior of the pot facility looks like a legitimate doctor's office. “I think most people believe that dispensaries really cater to the recreational user of marijuana,” Supervisor Stone said in the Dec. 14th article. The county intends to invoke code enforcement powers and lawsuits to pursue dispensaries unless operators voluntarily shut down. The county also plans to seek recovery for all legal costs associated with its efforts. For weeks, Idyllwild Me has been rallying to close that dispensary down. It has a tremendous amount of activity at all hours of the day and night. Cars drive up and park and within 30 seconds, they take off again. It happens at 6 a.m. as well as 8 p.m. on Sundays and holidays. Is all this activity legal? Are all of these people terminally sick with legitimate green cards? We hardly think so. However, according to the Dec. 14th article in The Californian, police officers have been lobbying elected officials to find a way to close pot dispensaries down for years. They could start by looking at the dispensary’s books. Bet the hundreds of customers the Valle Vista pot dispensary sees each day only pay quick cash, and there’s no credit card and check receipts. Perhaps the IRS would like to see the books too, and get their fair share. Corinne Daly said Supervisor Stone’s office would keep us apprised of their progress. 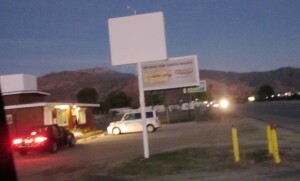 The legitimate medical marijuana dispensary, located at 44518 Florida Avenue (across from the Shell Station at Lincoln Avenue) in Hemet/Valle Vista, has a tremendous amount of activity at all hours of the day and night. Cars drive up and park and within 30 seconds, they take off again. It happens at 6 a.m. as well as 8 p.m. Is all this activity legal? Are all of them sick with legitimate green cards so they can buy marijuana? We hardly think so, but an officer from the Riverside County Sheriff’s Department said tonight (Nov. 28) there’s little that can be done about it. She suggested that perhaps everyone we’ve seen frequenting the place had legitimate green cards (which are cards prescribed by their doctors). So there’s nothing that can be done about a medical marijuana dispensary gone bad? During any given day, when you fill up at the Shell Station, look across the street to see how many cars pull up and leave from there. If our 5-minute projection is correct, they may have more than 500 customers a day! What if that dispensary wasn’t reporting that much business on its books? Is that enough reason for the police to raid them? Our tip came from a teenager who lives in Idyllwild. He casually pointed to the dispensary as we drove by in the car. “You can buy marijuana there,” he said. If this marijuana dispensary is legitimate and popular as all get-out, then why not put a sign out front? There’s a large blank white sign in the parking lot left over from when it was called a tire shop six months ago. Why not put the business name in bold letters: Valle Vista Medical Marijuana Dispensary? Underneath they could brag about their popularity like McDonald’s does: “Over 1 billion customers served.” That way, everything would be above board. Parents in the neighborhood and church goers would all know, as well as the junkies, and then let the chips fall where they may. The officer suggested that anyone concerned about illegal drug activity at the Valle Vista Medical Marijuana Dispensary contact the Riverside County Drug Activity Tip Line at (951) 955-6384. All tips can be anonymous, but if you leave your name and phone number, then an officer will contact you for followup information. We left the tip line information about the Valle Vista dispensary, along with the editor’s name and phone number on their answering machine. We’ll see if we get a return call. In the meantime, there’s a dispensary at the bottom of the Hill (about 15 miles from Idyllwild) where almost anyone can buy marijuana. Unless there’s proof of illegal activity, it will continue to service the area well. To contact the Riverside County Sheriff’s Department’s 24-hour non-emergency line, (800) 950-2444. The address to this popular building in Valle Vista is clearly marked on the front. The brown building with white trim looked just like any other doctor’s or dentist’s office in Hemet/Valle Vista. Only that this one, across from the Shell Station on the corner of Florida and Lincoln Avenues, had a lot of activity. 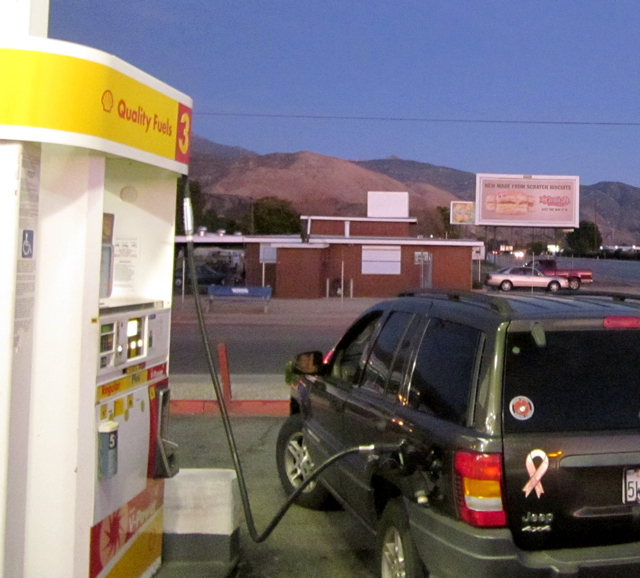 In fact, in the five minutes it took to fill up my car, four cars had come and gone. 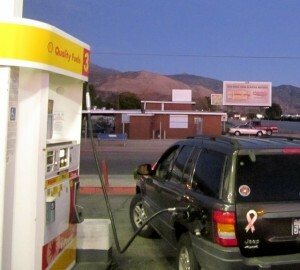 And one heavy set guy, who gassed up at the Shell Station, had walked over there and returned within those few minutes. What was going on here? Was this a crack house? I’ve lived down the street from drug houses in Chicago and Idyllwild. The drug dealers in Chicago had it down to an art. Cars would stop in the street and honk, and they would run out in their neon green shirts to serve them. At any drug house, there’s always a lot of activity and no one sticks around for long for fear of getting caught. I also used to cover crime for the Idyllwild Town Crier, and had once interviewed a potential drug dealer in Garner Valley. So I’m naturally suspicious. Several months back, this brown building used to be a tire shop. But it wasn’t open for long. Now, there is only a blank white sign, but the address, 44518, is clearly marked on the front of the building in 12-inch letters. A crack house wouldn’t be so obvious. “That’s where you can buy marijuana,” said a teenage boy from Idyllwild who was riding in my car as we passed the place one afternoon. I didn’t think much about it then, but wondered how he could be so casual about those things with an adult. But each time that I filled up my car at the Shell Station, it nagged at me. There was way too much activity going on over there for my comfort level. This time, I decided to take pictures as proof. Except on my camera, there’s no time marker. In one of my pictures, a guy in a blue hoodie, looked up and saw me. I pretended to be messing around with my camera, just taking odd shots to get it to work again. Always take a picture of your foot. (That’s an old street photographer’s trick). On the way up the hill, I called 911. After all, that hoodie guy could be a drug dealer who had already memorized my plates and told his friends. I could be dead by morning and no one would know why! I told the dispatch operator what I knew, including the remark from the Idyllwild teen whose mother lives in Hemet. They took my phone number and said that they would send someone out to investigate. Within a few minutes, a Hemet police officer called me back. She said it had been operating for about a year now, and fellow officers have checked them all out for validity. “That’s where people can go when a doctor prescribes them marijuana,” she said. I thanked her and hung up. It must be like the medical marijuana places in Venice Beach that attract so much attention with tourists. 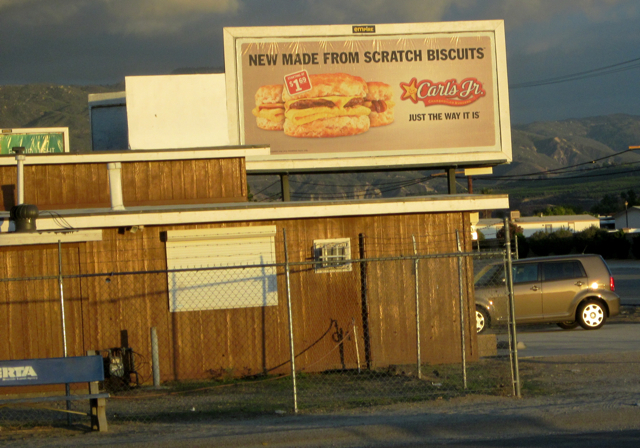 That explains why this nondescript building in Valle Vista, with a huge address, has so much activity. I ran a quick check for “marijuana dispensaries” on Google, but the 44518 Florida address didn’t show up. 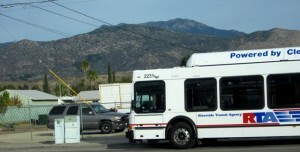 However, another one in Hemet and more in Palm Springs, Beaumont, Perris, Murrieta and Riverside, appeared. Yet, I remain on guard. Could a medical marijuana place go bad? Could that be what’s happening in Valle Vista? Are they legally and illegally selling marijuana at the same time? If everything was above board, then why do their customers only stay for two seconds? That’s the behavior of someone who doesn’t want to get caught, not a cancer patient who wants to feel a little better. This marijuana dispensary is too close to my favorite Shell Station for comfort. If there’s a police shootout and one of the bullets hits a gas truck or tank, then everything could blow sky high! Yep, I’ve seen it on TV! With my luck, I would be gassing up on pump number 7. Posted in Crime, idyllwild | Comments Off on Valle Vista Marijuana Dispensory? 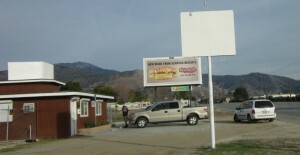 The Mile High diner’s sandwich board along Hwy. 243 read, “Welcome Hunters,” and outlined a few specials. Welcoming hunters seemed out of place for a tree-hugging town like Idyllwild that’s situated in a national forest. Yet, it’s legal to hunt deer this time of year–in restricted areas–which means away from civilization, and certainly not from the road. Still, coming around a bend towards Banning, a hunter appeared in dark camelflage gear with a rifle slung over his shoulder. He had the bearing of a military man (trim with good posture) and wore a camelflage hood, instead of a cap. He was walking towards his car parked in the pullout. There was another guy in the driver’s seat. For that split second when I passed, I couldn’t keep my eyes off of that gun. It had such a long bayonet, almost looked like a sniper rifle. 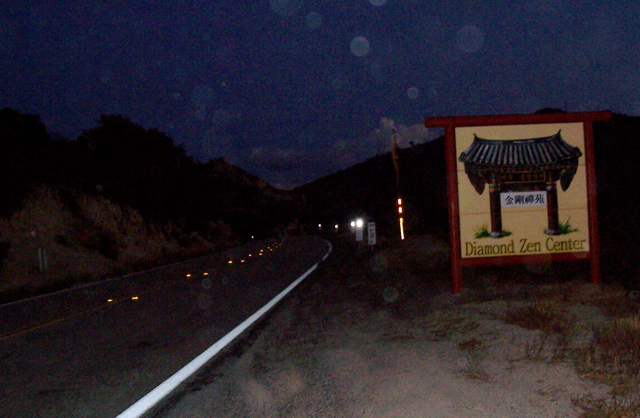 It scared me a little because it was broad daylight and I had teenagers from China in the car. I didn’t want to field any questions of why a strange man was carrying a rifle along the road. Certainly it was legal to hunt in these parts, but this guy was hunting (or scoping out his territory) at 1 p.m. on Wednesday afternoon about a half mile from the Zen Mountain Center, a buddhist retreat, and a popular RV park a little further beyond. 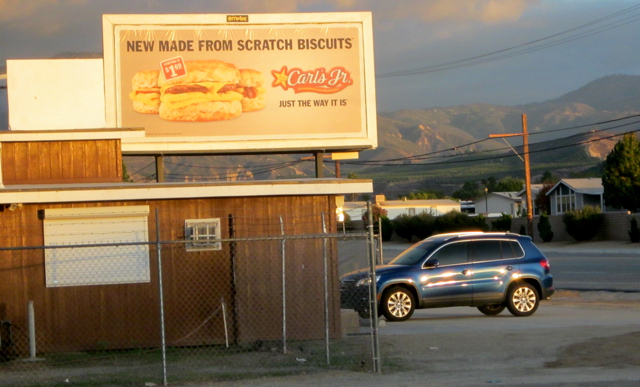 It didn’t seem right, so I called the California Highway Patrol (CHP) in Banning. They immediately connected me to the Riverside County Sheriff’s dispatch operator. She wanted to know what the hunter looked like, what he was wearing, his race, the make of the car, who was with him, and how long ago that this happened. Of course, I couldn’t remember much because I was so mezmerized with that rifle. 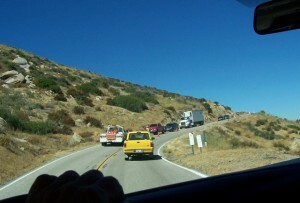 All I know was there was another guy with dark hair driving, and the car was pointed in the direction of Idyllwild. However, one good thing I remembered was mile marker 2o:15. A CHP assigned to Idyllwild once taught me to look for mile markers when reporting accidents or anything along highways. Better than landmarks, it helps them pinpoint where events have happened. I asked the dispatcher if it was legal to hunt there. She said she’d send someone right out to investigate. Out of curiosity, I pulled over in the same pullout by mile marker 20:15. The sun was just setting and there was still some light left. Looking over the edge of the pavement, I was shocked. 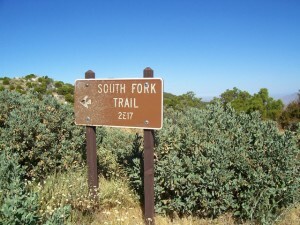 The terrain below was so rocky and steep that not even a Bighorn Sheep could make it through there without difficulty. There were piles of rocks and sharp, yucca shrubbery. The few, bare trees were still blackened from the fire that swept through there three years ago. Anyone with any sense would never attempt to walk through that terrain. You could twist an ankle and easily lose your footing and fall a ways down. So those hunters must’ve been survivalists to come up from that terrain. And what could they possibly shoot from there? No deers are out mid-day, and it’s particularly bleak terrain. There would only be ground squirrels, snakes and hawks around. 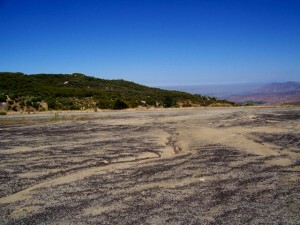 However, quail and doves could be a possibility, but they usually like to be around water, and there was none in sight. 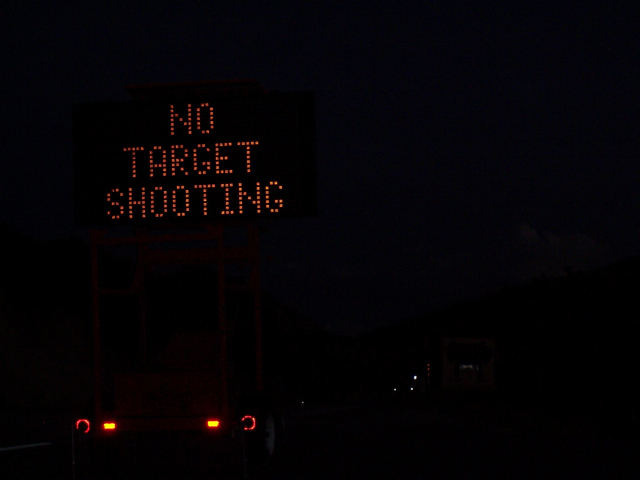 Target shooting is likely, but reckless so close to a highway and near people in the canyon. The road to the Zen Mountain Center was clearly visible from the pullout, and you could see the large water tower from the RV park nearby. 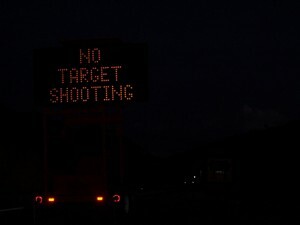 Now I know why the Riverside County Sheriff’s Department acted so quickly to apprehend those hunters, and order the Caltrans sign. Naive or arrogant hunters need to know the rules around here. The terrain is dangerous for them, and their recklessness disregard is dangerous for us. 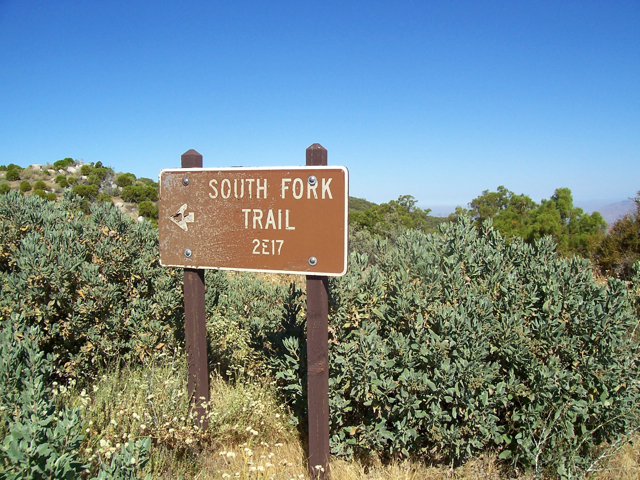 For more information on hunting in Southwest Riverside County, visit the California Department of Fish and Game’s web site at www.dfg.ca.gov. There is a 64-page “California Hunting Digest” that outlines all the rules and requirements. For reference, Idyllwild, Palm Springs and Hemet are located in the D-19 hunting area, while Banning, Morongo Valley and Joshua Tree fall into the D-14 hunting area. “Be Prepared to Stop,” a familiar bright orange sign, warns motorists of a construction crew ahead. 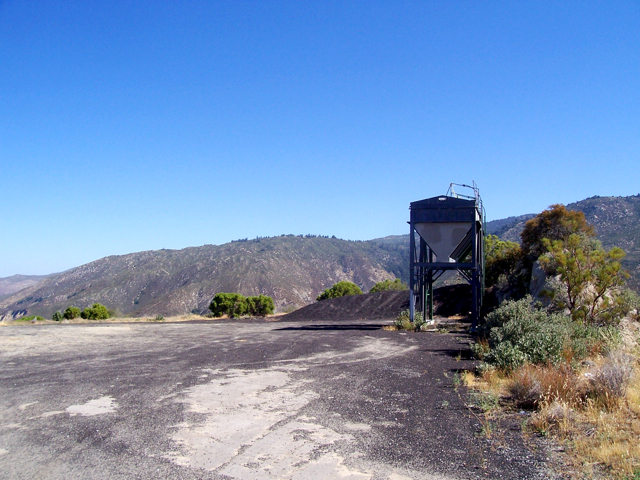 CalTrans, Idyllwild’s savior during inclimate weather, is preparing the roads for the rain and snow. 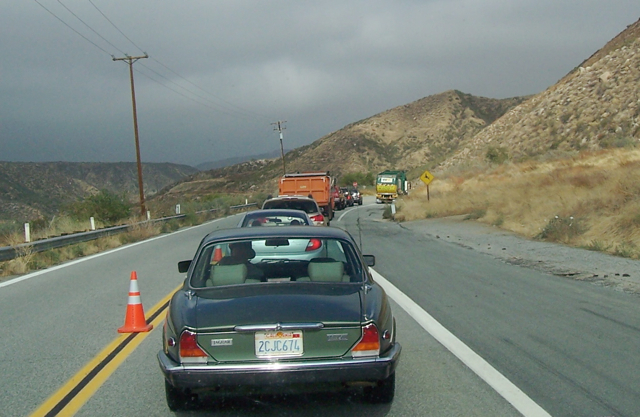 Today, Oct. 12, there’s a slowdown on Hwy. 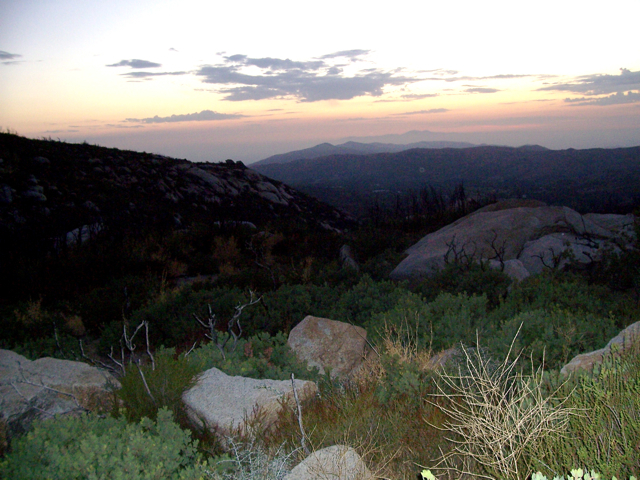 243 from Idyllwild to Hemet for about a three-mile stretch (from mile marker 74:53:25 to mile marker 74: 55:50). The wait lasted approximately seven minutes, however, it must’ve seemed like eternity for the group that was waiting to go next. You see, I was the last car in the caravan behind the “Follow Me” truck. Just for fun, I lagged behind so that the car ahead was well out of sight. By doing this, I made more than a few motorists wait longer, I probably made a few guards sweat. Where is the last car? Why is she taking so long? Why did she wave at the prisoners? Is she really taking pictures? Wait a minute, what prisoners? 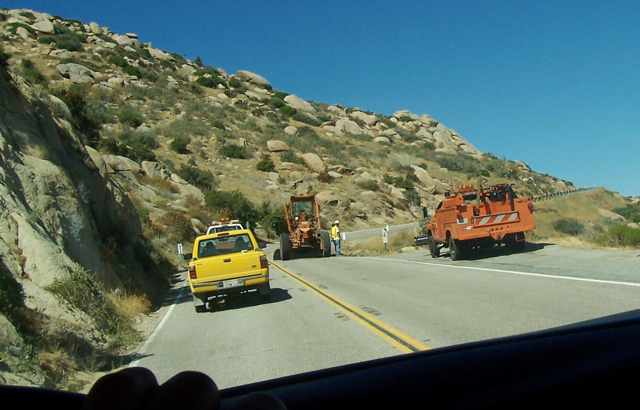 Dressed in neon orange and green, looking just like CalTrans workers, are select members of the Bautista Fire Crew. They’re not construction workers or firemen, but inmates from the Larry D. Smith Correctional Center in Banning. They travel in a bright red fire truck that has “Bautista Fire Crew” printed on the side. They are heavily guarded by wardens from the same prison, also dressed in neon green and orange and impersonating CalTrans workers, except that they’re carrying radios and rifles. That’s right, when the Bautista Fire Crew is working, there are always lots of CalTrans trucks around. Most of them are situated at various points along the road, not to observe the work in progress, but the convicts. Are they whacking the weeds like they should? Are they talking to any motorists? Are they going to escape? In exchange for manual labor, such as weedwacking, shoveling, raking, or even fighting fires, these guys likely will get a reduced sentence. Keep in mind, these are not hardened criminals who have killed anyone or set any place on fire. They’re awaiting arraignments, hearings, trials, and sentencing, or they’ve been sentenced to serve a county jail term. These are inmates from a medium-security prison that are deemed eligible to work and interact with the public. Because for a brief moment, when you drive by today, you’re interacting with them. Dressed up in their neon CalTrans vests, these 15 prisoners look like normal workers. But normal workers don’t look right into each car, and straight into your eyes as you pass by. They’re busy working on the road. But these guys, for their free labor and payback to society, are also checking you out. Because, for a very long time, all they’ve seen are the same bunch of guys from the same correctional center. There’s been a long history of inmates working along Hwy. 243, according to the Larry D. Smith Correctional Facility web site. In fact, it proudly mentions that prison chain gangs built Hwy. 243 in the 1930s. That makes sense now. As you loop back and forth along Hwy. 243, from Idyllwild towards Banning, you can’t help but get a scenic view of the prison every time. It’s as if the road was paying homage to it. The first time I heard of the Bautista Fire Crew was about three years ago when I covered a brush fire on Hwy. 243. 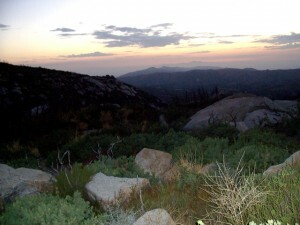 I was a freelance writer for the Idyllwild Town Crier at the time, and eager to please. Covering a midnight brush fire was front-page material, I thought. There must’ve been 15 trucks in all. The fire was under control, but still burning a little. I reported on what I saw, took a lot of dark pictures and even talked to some of the firemen. In the last paragraph, I mentioned that the Bautista Fire Crew, that was still battling the blaze, appeared to be working the hardest. The next day, my editor took out the reference. “Why did you do that?” I asked. It didn’t seem fair that the other firemen should take all of the credit. “Because no one wants to read about convicts,” she answered. I walked away in silence, shocked that the state would use convicts to fight fires. “But, why not, if they’re willing?” I reasoned later. Apparently, a lot of people in Idyllwild know about the Bautista Fire Crew, and are OK with it. So now you know. The next time you see one of those bright orange “Be Prepared to Stop” signs along Hwy. 243, you’ll be looking at the situation with new eyes. Where you once only saw CalTrans workers, you’ll now notice the guards, the inmates and the trucks. It’s not prudent to lag behind the “Follow Me” truck, or take pictures of the convicts. 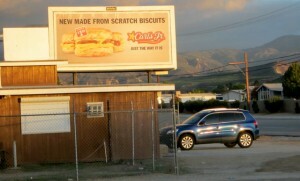 The CalTrans crew, or prison guards, won’t like it. And you don’t want to make those carrying guns nervous. For more information, contact the Larry D. Smith Correctional Facility, located at 1627 S. Hargrove Street in Banning, (951) 922-7300.